TrafFix Devices products are available in: United States, Canada, Mexico, Brazil, European Union, Turkey, South Africa, Saudi Arabia, China, Taiwan, Australia, New Zealand, Japan, and others. 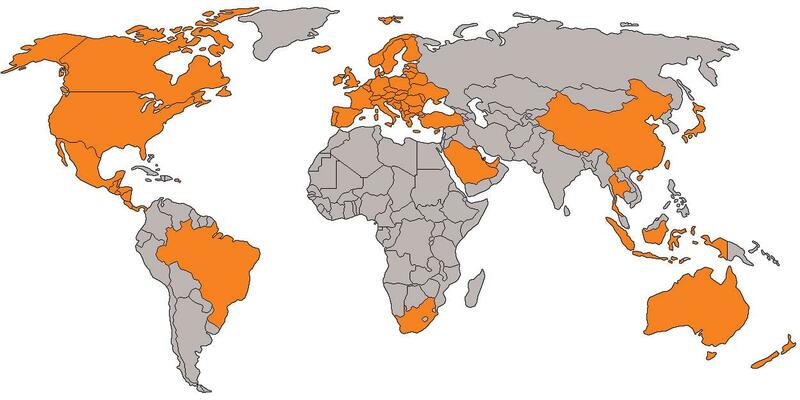 Contact Us to see if our products are available in your country. On April 1, 2008 TrafFix Devices opened the doors to their new corporate headquarters on Avenida La Pata in San Clemente. Moving all of the operations to one location has streamlined communications between departments, which in turn has improved the efficiency of new product development and has helped to speed up manufacturing and expedite the shipping worldwide. TrafFix Devices products are sold to rental yards, traffic control companies, road & highway contractors, ministries and state departments of transportation, military, and utility companies; as well as cities and counties all over the United States, Canada, Australia, New Zealand, Sweden, Europe, South Africa, Mexico and the Middle East.